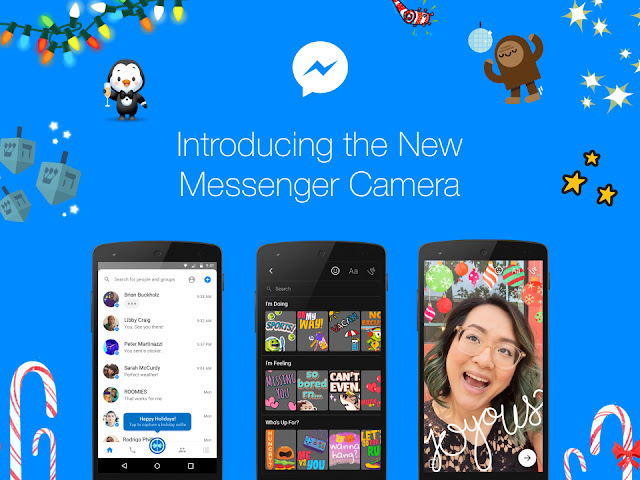 We are pleased to announce today a new, faster and easier-to-use camera function for messengers. With numerous design possibilities and special effects, entertainment is now even better. The new camera will be available worldwide in the coming days. Communication via Messenger is becoming more and more visual - every day messengers send over 2.5 billion emojis, photos, stickers and videos. People are increasingly using the camera instead of their keyboard. Because more and more people use the messenger in their daily lives, we wanted to make sending photos and videos even faster, easier and more entertaining - so we developed the new messenger camera. It is now even faster and easier to capture moments and share with others. The new messenger camera is available directly in your inbox and is just a click away - no matter if you are already in a conversation or the app has just opened. The shutter is centered at the bottom of the screen: With one click you take a photo and if you hold down longer, a video is recorded. In addition, we introduce a new place where you can find stickers, pictures, frames and special effects. We are very pleased to introduce 3D masks and special effects that make it easy to transform your photo into a work of art. Just try it out - you can make a self portrait and turn into a reindeer, play with snow, or just ask someone how he is. It's the perfect way to send a little happiness with your messages. We have also added thousands of stickers, frames, masks, and effects from which to choose. We have worked with artists and influencers worldwide who have personalized these little extras according to their preferences. And that was not all! Even your text messages can be even more entertaining in the Messenger. Just click the palette icon on the trigger to add images and stickers to your text. So your conversations about what you are doing, how you feel and what you are planning even more colorful. Of course, it is still possible to send a plain text message. All the functions you know and love from the Messenger remain the same.